Here's a selection of events sent in by many of our ex pupils and members of staff. Brian Kermode has sent in this picture for publication. The photograph appeared in the Wallasey news on the occasion of the 1961 Road Safety Cycling Proficiency Rally. This was an 'In-House' competition and Brian represented New Brighton House who were the winners! 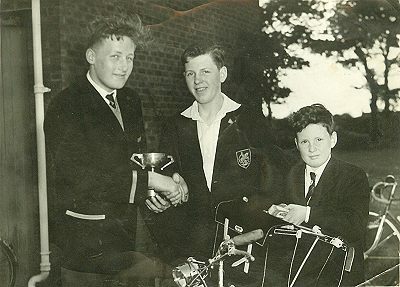 Brian, who came second in the individual awards, was in his first year at the time and can be seen on the right of the photograph. He is not sure of the other lads names, but the lad on the left was believed to be the Head Prefect at the time. The lad in the centre (4th Year) was the individual winner of the rally and beat Brian by only 1/2 a point. The winners had been presented with their prizes earlier by one of the Longworths who had a bike shop in Wallasey Village for many years. After the rally, St Georges formed a school team and took on the rest of the Borough at Egerton Grove. Brian can't remember how well they did but is sure they didn't win. Thanks to Brian for an excellent article. St Georges School joined forces with other schools from around Wallasey to form a 200 voice choir. It all took place at the Oldershaw School Hall. Lesley Swift sent the picture in and reckons Keith Mason is in there somewhere. Linda Costello was in the Choir and recalls one of the songs "Old MacDonald had a Farm". To see the picture, click here.